How to Judge Combust Planets, Children and astrology, Relocation, Vedic Jyotishi, Maharishi's wisdom, "Indian Astrologer", "Kavach" Astrology, Visit Jyotishremedies121.Com, Astral Remedies,"Kavach Information", Jyotish Remedies. ENERGISE YOUR WEAK PLANETS WITH SPECIAL POWER KAVACH >>>> REDUCE VULNERABILITY TO DREADED DISEASES WITH KAVACH OR SPECIAL POWER KAVACH >>>> MAKE YOUR LIFE BETTER WITH ASTRAL REMEDIES >>>> LEARN ASTROLOGY & JYOTISH REMEDIES - FREE ACCESS TO LEARNING MATERIAL >>>> ENRICH YOUR PREDICTIVE COMPETENCE THROUGH SYSTEMS' APPROACH. "HOW TO JUDGE COMBUST PLANETS IN ASTROLOGY"
The readers are well aware that planetary strengths are one of the important tools of predictive astrology. Among the various sources of planetary weakness, the greatest is the state of combustion. Combust planets lack the necessary power to protect and/or promote the significations and the houses ruled by them. Although there is very condensed mention of this subject in astrological texts and commentaries, the same carries a very deep meaning and has to be viewed in the form of a very useful hint. Whenever in a nativity a planet is combust, the native suffers with regard to the general significations and the significations of the house ruled by such a combust planet in such a manner that the suffering becomes memorable. It is like a tragedy or a serious setback, during the operational sub-period of such a combust planet. In case the functional malefic planets are conjunct with or aspect the most effective point of the houses, whose lords are combust, the significations of the said house(s) are impacted. In cases where the main period of such a planet does not operate then the results of the significations supposed to be provided by the combust planet are not enjoyed by the native. In cases where the main period operates and whenever the malefic planets transit the most effective point of the moolatrikona sign ruled by the combust planet, tragic happenings occur pertaining to the significations ruled by the planet. Sometimes the combust planets, when they are functional benefics, do bless temporarily the significations ruled by them to cause sufferings on a later date by snatching those blessings away. When the Sun is a functional benefic planet its conjunction with other well placed functional benefic planets is good and indicates exponential growth for the significations of the planets in close conjunction with the Sun. The combust planets suffer under the triple transit influences of functional malefic planets. This can, however, be guarded by application of the strengthening and propitiating astral remedies, to a large extent. 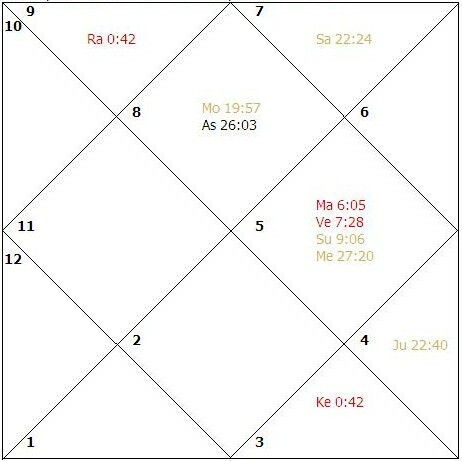 When the Sun is a functional malefic planet closely conjunct with other planets, or a functional malefic planet is closely and mutually influencing the Sun and any planets closely conjunct with it, the significations of all the planets involved suffer in their sub- periods as well as during transit impacts. The only saving factor is the close aspect/conjunction of the strong functional benefic planet. When some other planets, (Jupiter included) being a functional benefics are also combust then there is very little saving grace. If the dispositor of a combust planet is powerfully placed, beneficially aspected and is a functional benefic planet, the impact of weakness of the combust planet(s) may be a little less. If the dispositor of a combust planet is weak and badly placed and no strengthening measure has been used, the person suffers setbacks and serious problems. When the Sun causes combustion to a planet in its own mooltrikona sign, both the Sun and the combust planet become weak due to weakness of their dispositor. The results of the combust planet(s) are magnified due to the influence of the Sun but combust planets are vulnerable to damages due to natal and transit afflictions both in the sub-periods of the combust planets and when the combust planets are transited by the functional malefic planets. To reduce this vulnerability it is imperative to strengthen these combust planets by wearing a special power Kavach and a gem stone for the concerned planet in an auspiciously elected time. The Sun will carry additional malefic effects due to his being lord of a dusthana house, especially if the longitudinal difference between the Sun and the combust planet is less than five degrees. The power of the combust planet is very weak when it is in complete conjunction with the Sun and it is under the transit affliction. However, a combust planet in its own/exaltation sign or a sign from which it aspects its own sign does retain some power to do good. If a planet is combust and becomes lord of the ascendant of a divisional chart, whenever the functional malefic planets transit such planets in D-I the indications of the divisional chart either end or are badly damaged. According to the experience of the author, whenever the prime significator(s) is (are) combust and the lord of the navamsa ascendant is also combust, the marriage of the native whether a boy or a girl, whether rich or poor, beautiful or otherwise, is invariably delayed. Thus, denying the marital bliss in the peak years of life, delaying the fruits of the marital life that is delayed progeny and in case the period of such a planet operates, it results in the marital discord. Now the question is how we can minimize the effects of combust planets on the human lives. It has two main zones; (1) the physical ailments and (2) other significations of the planets. For significations we can take preventive measures. For example, for a person in whose natal chart Mercury is combust he can and should avoid speculation, gambling etc. The planets that are combust but not functional malefics can be made strong by use of a Kavach or a Special Power Kavach. The planets that are combust and at the same time are functional malefics also have to be propitiated by charities. The last of all is psychological understanding to cope with the weak areas instead of straining to remove the weakness and then suffering a mental disturbance. The author has closely observed natal charts with combust planets and has found that in cases where the period of such a combust planet operates, it gives unfavorable results through inordinate delays, denials and sufferings caused by the transit planetary influences. In cases where the main period of such a combust planet does not operate, it's sub-period in the main periods of the functional malefic planets results in delay in the general growth of the individual and serious health problems. Of course, it goes without saying that whenever the sub-period of combust planets is clubbed by unfavorable transits or in the main periods of functional malefic planets, the combust planet really gives very bad results. It does not promote or protect its own general and particular significations. On the other hand, it causes strenuous sufferings to the native. The learned readers would find the efficacy of this point of view in the analysis of horoscopes. It acts as a very powerful predictive tool because one finds horoscopes with combust planet(s) in the majority of cases. In the sub-periods of functional benefic planets, which are in the state of combustion, the significations ruled not only lack protection but the same are also inordinately delayed, denied or damaged. To augment the strength of the combust planets the natives are recommended to wear a Special Power Kavach in auspiciously elected times to (i) protect the significations ruled by these planets during transit afflictions; and (ii) to promote the significations of these planets. During the sub-period of a combust Moon, the mental peace of the person is lost. One's mother or wife may not enjoy good health. There are problems in acquisition and maintenance of property. The people try to avoid the person. If such a combust Moon is under the close influence of Rahu or the lords of the eighth and twelfth houses, the person gets involved in many vices and loses mental peace. One is vulnerable to epileptic fits, lung and mental disorders. During the sub-period of a combust Mars one is angry and suffers from injuries due to rashness and muscular disorders. One suffers from blood impurities, hypertension and multiple boils. If such a combust Mars is under the exact or close affliction of Rahu one becomes vulnerable to Cancer. During the sub-period of a combust Mercury one is confused, sensitive and slow in decision making. One suffers from over confidence or lack of confidence and nervous pressures. The peace of mind is disturbed. One becomes vulnerable to convulsions, paralysis, body-aches, breathing problems and skin diseases if the combust Mercury is under the influence of Rahu, especially from the malefic houses. During the sub-period of combust a Jupiter one suffers from liver disorders and fevers. One cannot concentrate on studies. There are obstructions in one's spiritual pursuits. One becomes selfish. One suffers on account of problems to one's male progeny and husband. If such a combust Jupiter is badly placed and is under the severe affliction of Rahu/Ketu or the lords of the eighth or twelfth houses, one becomes vulnerable to liver cirrhosis, jaundice and diabetes. During the sub-periods of a combust Venus, one faces loss of comforts. One's wife suffers from ill-health. In the case of females they suffer from urinary infections, malfunctioning of uterus and fallopian tubes. One becomes vulnerable to skin problems, eye-diseases and renal problems if combust Venus is severely afflicted by Rahu/Ketu or the most malefic planet. During the sub-periods of a combust Saturn one has to struggle more for success. One may suffer from bone fractures, pain in legs or spinal problems. One may get involved in leading the low class people or laborers. One does not enjoy good social respect. 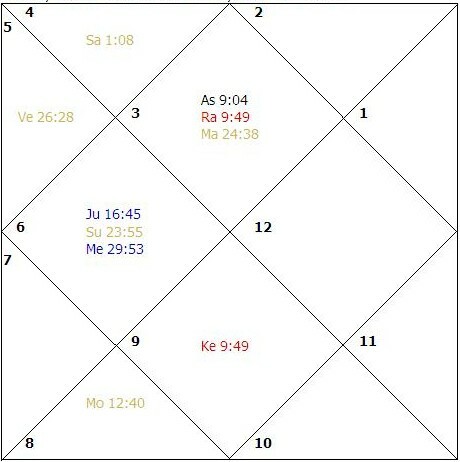 One is vulnerable to vices and loss of reputation and the particular significations of the planet when (i) Rahu/Ketu is closely conjunct with the Sun or any other planet, (ii) the Sun or any other planet forms close mutual aspect with Rahu/Ketu during the sub-periods of Rahu/Ketu and the planet(s) involved. During the sub-period of the combust lord of the first house one suffers from health problems and loss of status. The combust lord of the first house when severely afflicted by Rahu/Ketu or the most malefic planet makes one vulnerable to addictions, serious health problems and loss of status. During the sub-period of the combust lord of the second house one loses wealth, status, suffers on account of an inharmonious marital relationship and male progeny. The combust lord of the second house when severely afflicted by Rahu/Ketu or the most malefic planet makes one vulnerable to the diseases of eyes, thyroid, problems to teeth, problem of speech and results in sorrows on account of tragedy to male relations. During the sub-period of the combust lord of the third house one faces isolation and one's younger brothers face troubles. The combust lord of the third house when severely afflicted by Rahu/Ketu or the most malefic planet makes one vulnerable to the breathing problems, mental retardation and financial losses through business ventures. During the sub-period of the combust lord of the fourth house one loses mental peace and properties. One's mother and education suffer. The combust lord of the fourth house when severely afflicted by Rahu/Ketu or the most malefic planet makes one vulnerable to the loss of assets, loss of parents, cardiac disorders and unhappiness through marital discord. During the sub-period of the combust lord of the fifth house one's concentration is lost and one suffers unhappiness regarding the performance of children. The combust lord of the fifth house when severely afflicted by Rahu/Ketu or the most malefic planet makes one vulnerable to the loss of children, losses through speculative investments, gambling, liver cirrhosis, stomach disorders, spinal inflammations and gall bladder problem. During the sub period of the combust lord of the sixth house one suffers from ill-health arising out of acidity, inflammation of intestine, renal disorders, etc. The combust lord of the sixth house when severely afflicted by Rahu/Ketu or the most malefic planet makes one vulnerable to losses through thefts, fires, litigation and cheatings. During the sub-period of the combust lord of the seventh house one suffers from problems in marriage, partnerships and in foreign lands. The combust lord of the seventh house when severely afflicted by Rahu/Ketu or the most malefic planet makes one vulnerable to marital discord, cheating in partnership business and sufferings from severe difficulties in foreign lands. During the sub-period of the combust lord of the eighth house one suffers from obstructions and delays and one's life is threatened. The combust lord of the eighth house when severely afflicted by Rahu/Ketu or the most malefic planet makes one vulnerable to fatal accidents and one's father may suffer financial setbacks and severe health problems. One also faces divorce in marital relationship. During the sub-period of the combust lord of the ninth house one's father suffers from problems and the person gets setbacks in life. The combust lord of the ninth house when severely afflicted by Rahu/Ketu or the most malefic planet makes one vulnerable to physical handicaps and prolonged health problems. During the sub-period of the combust lord of the tenth house one gets persistent professional setbacks and has to move away from his native place. The combust lord of the tenth house when severely afflicted by Rahu/Ketu or the most malefic planet makes one vulnerable to arthritis, government action, loss of reputation and sufferings on account of one's child(ren). During the sub-period of the combust lord of the eleventh house one faces loss of income and trouble to friends and elder brother(s). The combust lord of the eleventh house when severely afflicted by Rahu/Ketu or the most malefic planet makes one vulnerable to blood cancer, isolation and penury. During the sub-period of the combust lord of the twelfth house one faces separation in marital relationships and loss of comforts. The combust lord of the twelfth house when severely afflicted by Rahu/Ketu or the most malefic planet makes one vulnerable to drug addiction, imprisonment and prolonged hospitalization. It is imperative to seek astrological help through preventive horoscope analysis and strengthen one's combust and other weak planets to avert setbacks in life. It is also necessary to perform propitiatory astrological remedial measures for the afflicting planets to enjoy a peaceful life. The readers may refer to frequently answered questions on Combust Planets in my book, Systems' Approach for Interpreting Horoscopes. The following charts show the setbacks and delays due to combustion of the natal planet(s) amongst other factors. Birth: October 10, 1945, 2230 hrs. The sign Gemini rises in the ascendant and Rahu and Ketu are the functional malefic planets. The lord of the seventh house which is the prime determinant for marriage and is the significator for husband is weak as it is combust. The lord of the fourth house, Mercury is weak as it is in the state of combustion and is in old age. The lord of the house of the family, the Moon, is debilitated and is badly placed in the sixth house and is in its sign of debilitation in D-IX, as well. Rahu-Ketu axis is close to the most effective points of the houses occupied and afflicts the houses occupied and aspected. Saturn, the lord of the house of fortune, is weak as it is placed in the state of infancy and its dispositor is debilitated and badly placed. The weak Jupiter becomes the lord of the ascendant of D-IX. All the significator planets for marriage are weak. The marriage was delayed and the native was finally duped into a marital alliance by a person who was already keeping a woman as permanent mistress in the sub-period of the debilitated second lord, the Moon, of the natal chart placed in the sixth house. Due to the weakness of the lords of the fourth and seventh houses due to combustion, the native could not save her marriage in spite of her best efforts. Birth: January 20, 1985, 1040 hrs. The sign Pisces rises in the ascendant and the Sun, Venus, Saturn, Rahu and Ketu become functional malefic planets. Jupiter is utterly weak as it is combust, in the state of infancy and is also in its sign of debilitation. 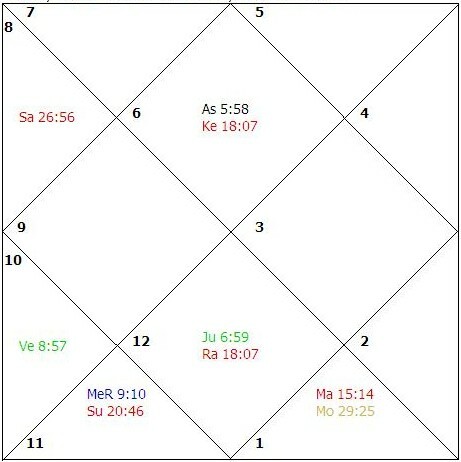 Jupiter is closely conjunct with the lord of the sixth house and is severely afflicted by the exact aspect of Rahu. The Sun becomes the prime significator of health in this case. The significator of longevity, Venus, is weak as it is badly placed in the chart. Mars is weak as it is badly placed in the chart and is closely afflicted. The Moon is weak as it is in the state of combustion and its dispositor is utterly weak. Saturn ruling the twelfth house is in exact conjunction with Ketu. Mercury is weak due to the utter weakness of its dispositor. There are exact afflictions and all the functional benefic planets are weak. The child had frequent ill health during his childhood retarding his educational pursuits. This later on culminated in restricted avenues for his profession. The success in his professional life will be eluding. Whenever the lord of the tenth house in badly weak and afflicted the life span of the native is also short. The lord of the eighth and twelfth both signifying longevity in addition to the life giving planets in this case are weak. Birth: March 5, 1987, 1929 hrs. The sign Virgo rises in the ascendant and Saturn, Mars, Sun, Rahu and Ketu are the functional malefic planets. The lord of the ascendant, Mercury is weak as it is combust and located in the sixth house. Mercury primarily rules health and longevity. The Moon is weak as it is badly placed in the chart and is in old-age. The Sun ruling the twelfth house and becoming significator for longevity is badly placed. Mars is in its own sign in the eighth house. Both Jupiter and Venus are strong in the chart. In ashthamsa (D-VIII), Ketu and Rahu occupy the fourth house. The child died at the age of a few months in the sub-period of Rahu and the main period of the badly placed Sun during the stationary transit influence of Rahu/Ketu axis operating at birth due to the weakness of a significator of longevity in the child's infancy. The sign Scorpio rises in the ascendant and Mars, Venus, Rahu and Ketu are the functional malefic planets. Jupiter and Saturn become prime determinant planets for marriage. Jupiter is weak as it is placed in its sign of debilitation in navamsa and its dispositor is weak. Saturn is weak as it is badly placed in the chart and its dispositor is weak and afflicted. Venus, the lord of the twelfth house, rules the continuity of married life. Venus and Mars are combust and are mutually conjunct with each other indicating conflicts in marital relationships. The Moon is weak as it is placed in its sign of debilitation. Mercury is weak as it is placed in the state of old-age. Saturn, the lord of the ascendant in navamsa occupies its sign of debilitation in D-IX and is closely influenced by the Rahu/Ketu axis. The significator for husband, Jupiter too, occupies its sign of debilitation in navamsa. The combustion and affliction of Venus and the utter weakness of Saturn and Jupiter did not bless the native with marital happiness. Her two marriages ended in divorce. The first survived for a few months and the second for a few days. The native could not compromise with the immoral character of the spouse. Both the divorces took place in the main period of Venus and the sub-period of Jupiter. 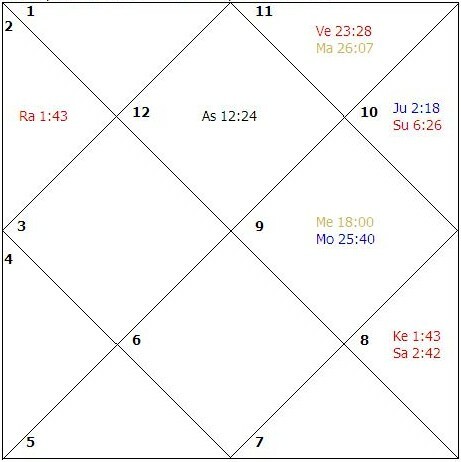 The tenth lord, the Sun, occupies its own moolatrikona sign in the main chart and is under affliction from the already afflicted twelfth lord Venus. The tenth house does not have any close malefic aspect to its most effective point. Two functional malefic planets are placed in the tenth house. In dasamsa no mooltrikona sign rises in the ascendant. Therefore, the main impact in this chart is of the lord of the tenth house of the main chart, the Sun. The job held by the native is affluent so far as income is concerned as the lord of eleventh house Mercury is placed close to the most effective point, but does not possess the authority as signified by the sign Leo and its lord in the tenth house.